[Bahrain]. A collection of 27 vintage silver prints of Bahrain and Saudi Arabia. Saudi Arabia, ca 1955-1960. 27 silver prints, various sizes (from 195 x 250 to 95 x 133 mm). Includes three coloured postcards of Mecca. 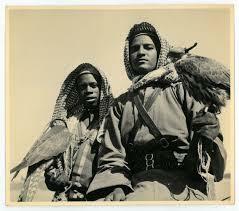 A set of rare photographs, most probably taken by professional photographers travelling to Bahrain around 1955-60. Most of the images are captioned in pencil, showing sites in Al-Muharraq and Manama (a tailor's shop, tobacco shop, hospital court yard Muharraq, Arab windows in Muharraq, wind towers, etc.) and everyday scenes (loading a sheep onto a raft, a falconer, etc. ).